We are rolling into our weekend with a list full of projects as we prepare to host family next week for my little brother's wedding. Even though we've gotten a lot accomplished with our house, every weekend there's still something left to do, and this weekend isn't any different! I'm hoping we can knock some things out and still get to have a little time to relax, too. It's the last weekend of the Nordstrom sale! The sale ends on August 6th, and while it seems like it's been going on forever, we're nearing the end of being able to snag some great deals. I've made several purchased and have made several returns, too. Here's my FINAL list of what I got: yellow sweater, bell-sleeved sweater, raw hem jeans, most comfortable shoes ever, and a flattering dress perfect for the holidays. 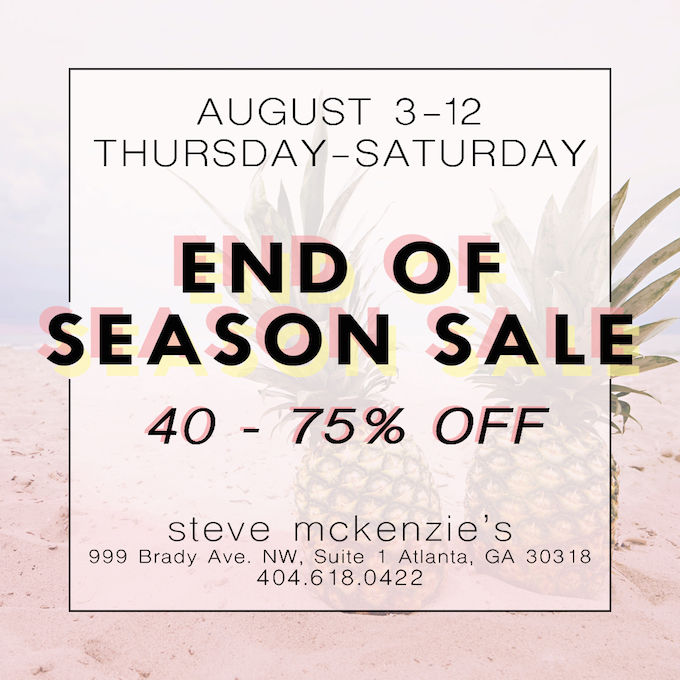 One of my favorite Atlanta gems, Steve McKenzie's, is having their huge summer sale: the entire store is 20% off. I am going to try to pop over there this weekend because things like lamps, coffee table books, and frames are at even deeper discounts - ranging from 40%-50% off. I definitely need lamps, and I'm positive I could find a few other things, too! My dear friend, Lauren, is hosting an event this weekend in honor of her sweet little boy who we lost earlier this year to Mitochondrial Disease. Mimosas for Mito is happening this Sunday from 11-2 at The Ivy in Buckhead. Get your tickets and join us to raise awareness for this devastating disease. Total Row extended their five classes for $50 offer through this Sunday! Use the code 5for50 at checkout and then go get your row on. I forgot to get my classes last weekend, so I'll be snapping them up before Sunday - and then maybe I'll see you at a TR class soon!